New York City Approves Municipal ID Cards for Undocumented Immigrants | Democracy Now! Democracy Now! co-host and award-winning investigative reporter with the New York Daily News. The New York City Council has approved the use of municipal identification cards that will provide its nearly half a million undocumented residents with a way to prove their identity. Democracy Now! co-host and New York Daily News columnist Juan González says the progressive initiative is a big step forward for the immigrant community. He also discusses one of the Democrats’ most closely watched races. This week, 84-year-old Rep. Charles Rangel of New York declared victory over State Sen. Adriano Espaillat in a rematch of their 2012 primary, and secured his 23rd term in office. AMY GOODMAN: On Wednesday, New York’s City Council voted to create municipal ID cards that will give the city’s half a million undocumented immigrants a way to prove their identity. Also this week, you’ve reported on one of the Democrats’ most closely watched races, Congressmember Charles Rangel of Harlem declaring victory in a rematch of his primary race against Senator Adriano Espaillat in 2012. Charles Rangel is 84 years old. He has served in Congress for 43 years. Can you talk about both? JUAN GONZÁLEZ: Yes, Amy. Well, on the municipal ID card, obviously, with Congress still paralyzed over the issue of immigration reform, because the Republicans in the House are refusing to pass a bill to match that that was passed a year ago in the Senate, many local governments are taking matters into their own hands as best they can, and the City Council, under the new progressive leadership of Melissa Mark-Viverito, did pass this week a municipal ID law. 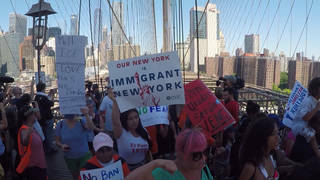 This allows at least between 500,000 and 600,000 undocumented residents of New York City to be able now to have some kind of identification when confronted by police or other government agencies, and to be able to carry some of their day-to-day life activities without this constant threat of not even having proper ID. So, it’s a big step forward for the immigrant community here in the city. As for the Rangel race, this was, as you said, a rematch. Back in 2012, Rangel barely defeated Adriano Espaillat, a state senator, by just about a thousand votes. It was a very bitterly fought campaign. There were a lot of charges from the Latino community of voter suppression, and there was a—many SNAFUs in the counting of the votes. So, now two years later, Espaillat challenged him again, attempted to challenge him from the left within the Democratic Party, accusing Rangel of being in the grip of a lot of the banking interests in the city. But the—and then, again, it was a close vote once again with just 1,800 votes separating the two men, with a lot bigger voter participation this time around. But Rangel prevailed once again, the “Lion of Harlem,” the congressman from the Mecca of Black America, even though his district is now largely a Latino district, a majority of Latino population. He was—and he got most of his support, the bulk of his support, from the black community, while Adriano Espaillat clearly got big support in the Latino community and won the majority of the white vote. But Rangel was able to pull away a significant share of the Puerto Rican vote in East Harlem and was able, thus, to barely eke out a victory. And he will return to Congress once again. AMY GOODMAN: Well, of course, we will continue to follow all of these stories, but now we move on to our main story today.